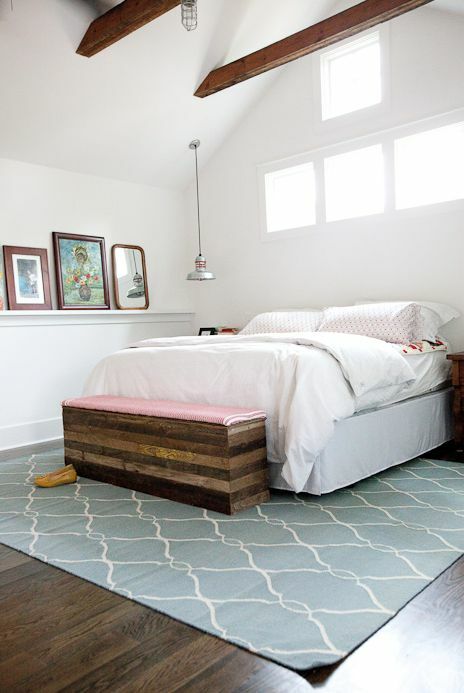 This cottage renovation is a labor of love led by designer Amy Jacobs. 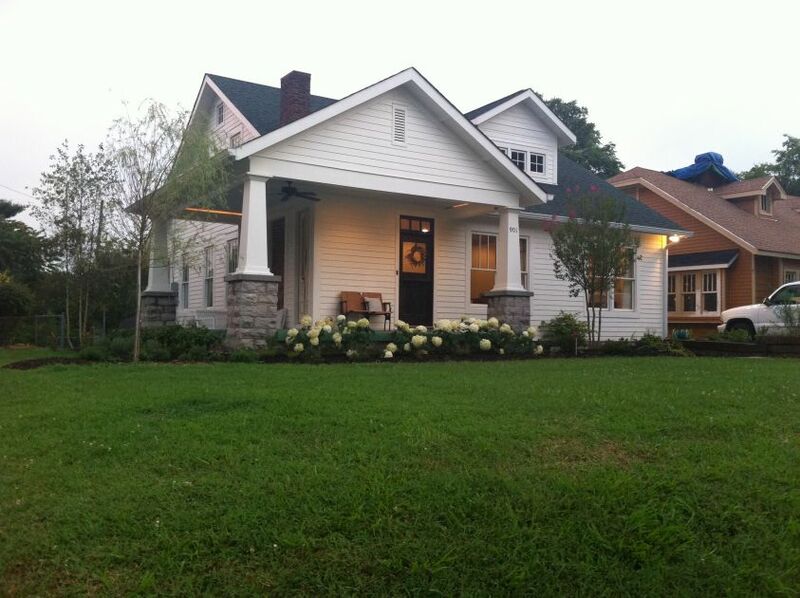 Amy runs Gather and Build, which she describes as a boutique design and construction collaborative, creating one-of-a-kind homes in Nashville, Tennessee. Amy prides herself in designing homes that are extremely unique with careful thought going into every single detail. Her Bradford Project is no exception. 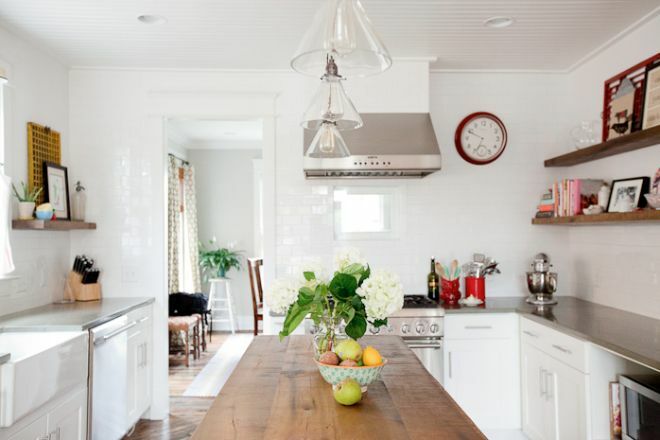 This 1940's cottage renovation features reclaimed wood floors, traditional trim, custom doors, and a reclaimed wood kitchen island. 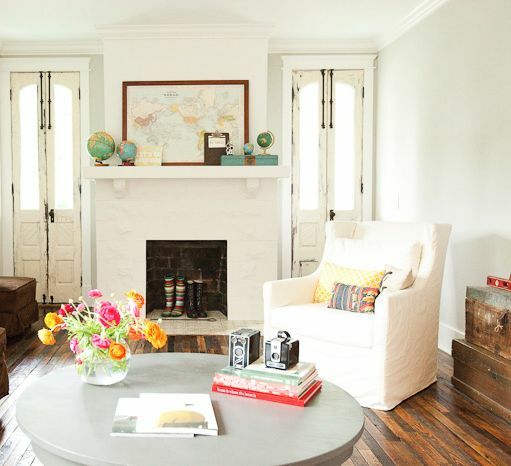 After the renovations were complete, Amy finished the home with eclectic decor using antiques and DIY projects for an extra special look full of character. Originally the fireplace was flanked by small windows. Amy and her team replaced the windows with these slender vintage french doors, they add unique flair and allow access to the porch. 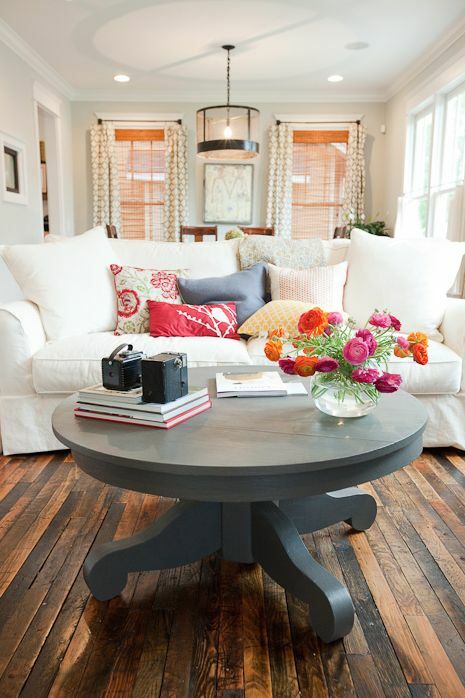 The coffee table is actually a re-purposed kitchen table. Amy cut the pedestal down and reattached it, then painted the whole thing using gray porch paint for durability. All the fireplace needed was a fresh coat of flat paint and new tile for the base. 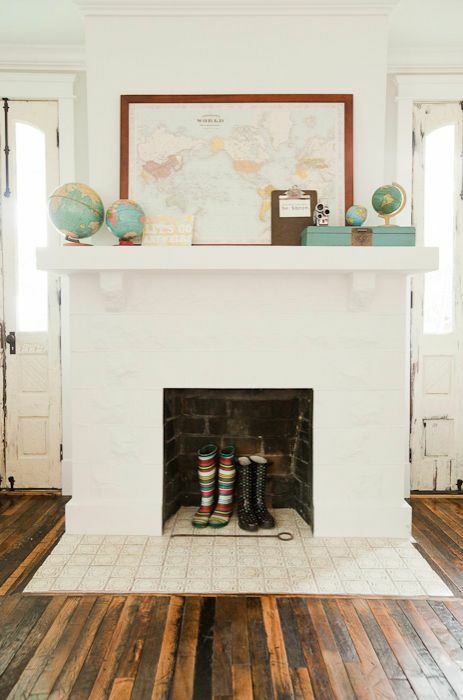 Amy says, "I love mantles because they are easily changed and are a perfect landing-place for collections." The kitchen features an island made from reclaimed wood, and sturdy concrete counter tops. Open shelving and industrial lighting give it a fresh and clean farmhouse feel. Gorgeous vaulted ceilings with exposed beams make the master bedroom feel spacious and bright. 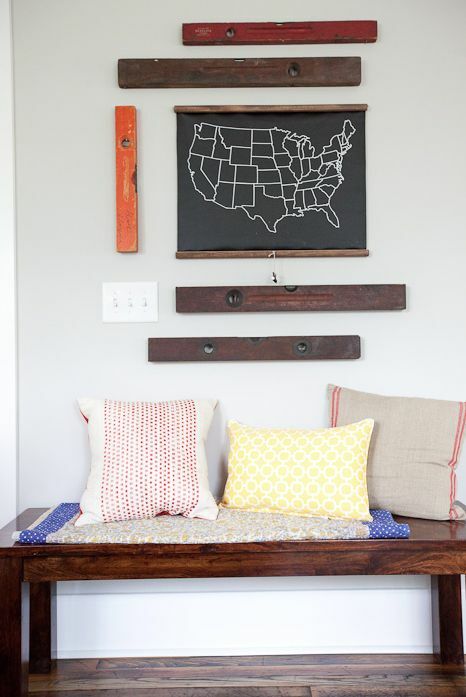 A ledge for displaying artwork is a unique alternative to the usual gallery wall. 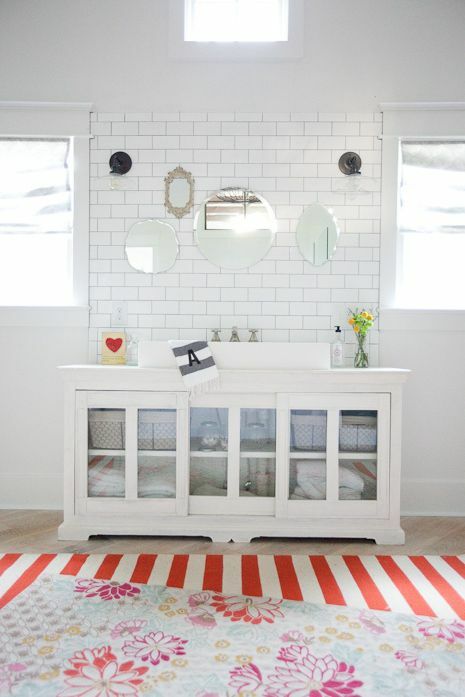 The attention to detail continues on in the bathroom with layered rugs and a vintage buffet used as a vanity. A collection of beautiful mirrors is used in place of one big mirror. The walls and baseboards are painted Sherwin Williams Snowbound. 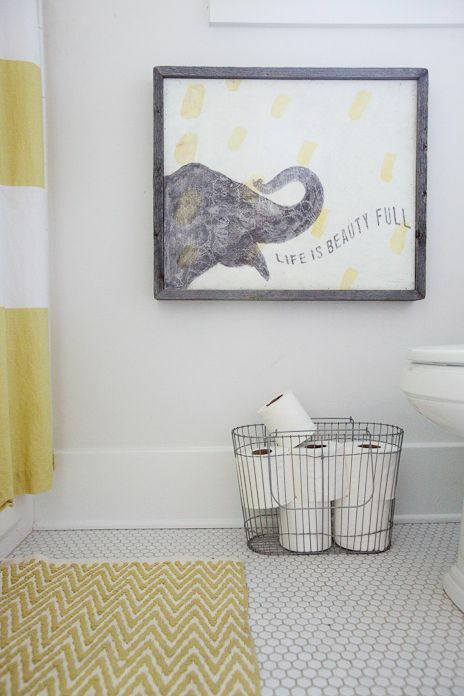 Keeping essential items on display, like this basket of toilet paper, is a great solution when storage space is limited. An area in the hallway features a bench with a few comfy throw pillows. Antique levels were hung as wall decor for yet another unique touch to this gorgeous home.